I’ve never actually been to a proper food festival before. Shocking, I know. So I was excited when I saw that The Foodies Festival was going to be right on my doorstep in Brighton and hurriedly booked tickets for it. When the day came around, the forecast was terrible- rain forecast pretty much all day. Obviously my husband and I were going to go anyway, armed with umbrella and crossing our fingers that the rainclouds somehow miraculously missed the festival. As it happened, they did- there was no more than a few little raindrops and it was otherwise warm and sunny the whole time we were there. There was so much to see when we arrived! 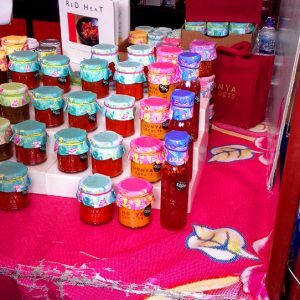 Artisan stalls of local and small businesses selling all manner of food and drinks to eat while you’re there and take away with you. There were also plenty of places to try products before you bought. There was also a stage with live music, three areas with time slotted demonstrations by chefs and bakers and a large covered area with benches to sit down and eat. It was already pretty busy when we arrived but throughout the day became more and more packed. We had already eyed up the places we wanted to eat at: the Shoryu ramen van for me (obviously! 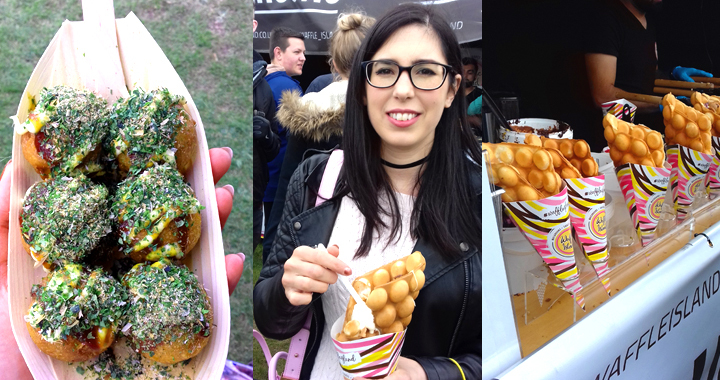 ), especially as they were serving takoyaki- a sort of fried ball with octopus and seasonings; the calamari stall for my husband (because you can’t beat calamari) and the Waffle Island stall, because I had never had a bubble waffle before and had to try it. The Shoryu takoyaki was perfection, as I would expect from one of my favourite Japanese places to eat. The calamari was crisp and delicious. The bubble waffle was good but I was disappointed that the topping were more like you’d see at an ice cream parlour. I wished I could have eaten more, but this relatively light load was quite enough for us as we were trying things as we went around. The artisan stalls were really the most interesting for me. 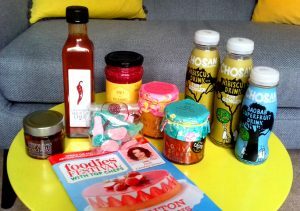 There were so many unusual foods and ingredients to try, including things I never imagined I would buy. The Green Valleys honey was a prime example of this. I don’t even like honey but I was drawn to their bright pink jar of honey with blackcurrant. It tasted so good I had to get a jar! Anyone who knows me knows I love chilli sauces and Carrington’s chilli products tasted so good, I bought a jar of chilli oil and a bottle of Shut up Chup chilli sauce. 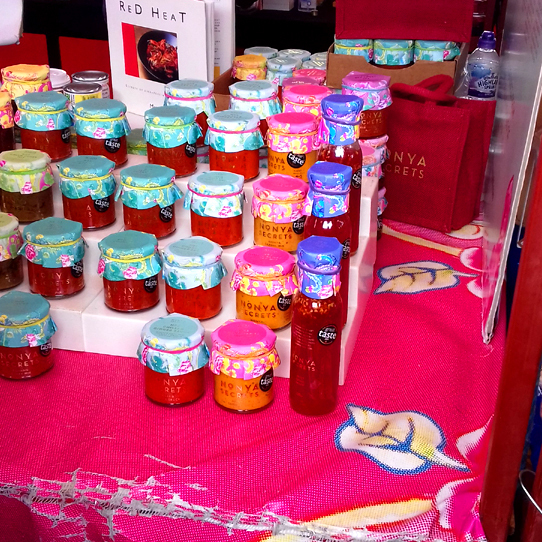 I also was interested to see Nonya Secrets Asian curry sauces. From classic Thai curries to Malaysian Sambal and sweet chilli dipping sauce, I loved how they had cooked the sauces with various meats and vegetables so we could taste the finished product rather than just the sauce paste mix. I bought the sambal and panang sauce mixes. Finally, we bought some drinks by a brand called Chosan. Both my husband and I don’t drink so it’s always nice to find new non-alcoholic drinks and these are hibiscus based and not too sweet- the fiery ginger tastes amazing! I wasn’t overly fussed about visited the demonstration tents for cooking and baking, as I don’t watch cooking programmes so I hadn’t heart of any of the celebrity chefs, but when I saw Alun Sperring from The Chilli Pickle Indian restaurant in Brighton, I was really interested as I have heard really good things about the restaurant. We managed to squeeze into the tent just before he started and watch him cook both a chicken curry and an aubergine curry. Both looked and smelt amazing, even from far back in the tent! It would have been nice to get recipes cards for these, but I can understand that the chefs want to protect their recipes. There were a few stalls that I thought could have been included for a better experience. There were amazing stalls with pastries, cakes, fudge and macarons, but no really good chocolate stall- selling slabs of artisan chocolate in interesting flavours. The only chocolate stall had more of an emphasis on savoury than sweet. I also felt that although the alcoholic side of drinks was very well catered for, there was a big shortfall of interesting drinks options for those of us who do not drink. I was hoping for a really good tea stall, as I love good quality teas and was especially hoping to see my favourite local brand Bluebird Teas there but alas, other than a vintage tea tent to buy tea and cake to drink there, there was no artisan tea stall, which was a shame. I know VIPs and special offers allowed for goody bags but I also feel it would have been nice to have included that in the normal tickets, as at £14 a ticket normal price, not even including a program at an extra £4, it was quite expensive to get in. All in all though, a very enjoyable day out with a vast wealth of food, drinks, samples. The Foodies Festival is touring the UK in various locations. Check out their website for details on the locations and dates. 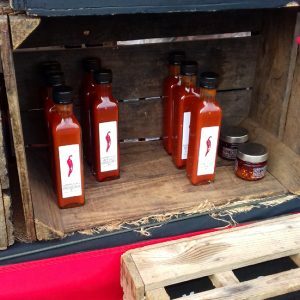 Posted in Reviews and tagged Food Festival, Review.